An active healthy lifestyle is essential to better health, longevity and enjoyment of life. Rates of obesity and associated cardiovascular disease, type 2 diabetes, and many other associated diseases, are on the rise. This can be a considerable cost to the community and is an issue that many people feel should be addressed. 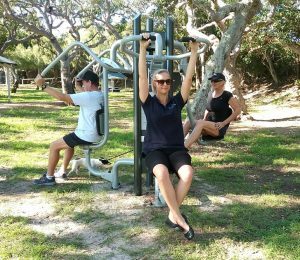 The Lions Club of Emu Park saw an opportunity to empower local residents to participate in a healthier lifestyle by making fitness equipment available. The object is to motivate and encourage people of all ages to exercise. 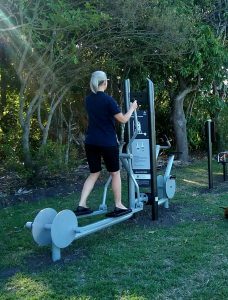 Following the installation of outdoor fitness equipment in locations along the popular Pattison Street walkway last week, residents are already actively using the equipment. As the equipment was being installed it was immediately in use by eager locals on their walks. The project has cost in excess of $50,000. This initiative of the Lions Club of Emu Park was made possible with assistance from the Gambling Community Benefit Fund. Local residents Erin Forder, Neville & Linda Bowles take time out for exercise. The equipment comprises a mixture of high quality outdoor gym equipment provided by Australian supplier, a-space Australia Pty Ltd. It is of robust construction and specifically designed to suit a broad range of ages and abilities. The equipment installer commented that everyone walking past was very interested in the equipment. He added that the Lions Club members should be extremely proud of what they have done as he has not seen such overwhelming community support for a project like this before. Previous Previous post: Oktoberfest is getting close.